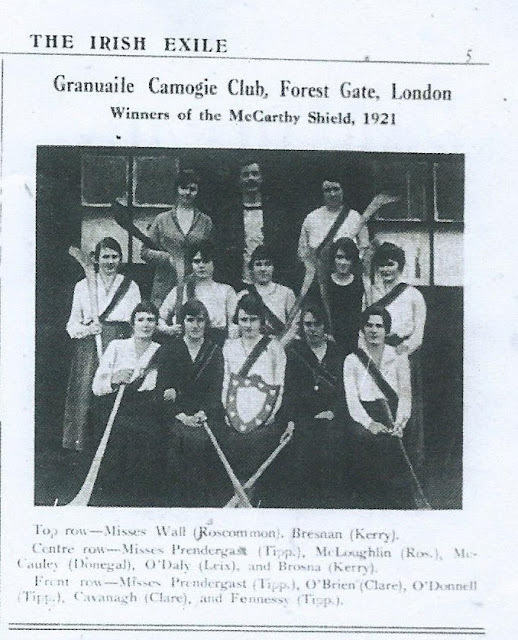 From its mid nineteenth century development into a busy metropolitan suburb, Forest Gate has embraced a thriving Irish community (see here for details of early Irish settlements in the area and here for details of early Irish immigrant-inspired Catholic education in Forest Gate). So, perhaps it comes as no surprise that there was considerable activity in the district campaigning for Irish independence before the creation and recognition of the Republic, in the 1920s. Forest Gate featured in three fairly dramatic, and probably linked, events around the time of the creation of the Irish Free State in 1921. It is a fascinating tale, revealed here for the first time. All we can do in this article is to set out the facts, and surmise on the connections and importance of the events. The British general election of October 1918 gave Sinn Fein an overwhelming mandate for independence in Ireland, but the British government refused to acknowledge, or act upon this democratic expression. This was not a new turn of events for the Irish people: from 1870 - 1918 those demanding self-determination had held four-fifths of all Irish Parliamentary seats, but to no independence avail. The Irish MPs elected in 1918 responded in January 1919 by making a Unilateral Declaration of Independence (UDI), and establishing the Dail Eireann in Dublin. London would not even negotiate with the body and 34 elected MPs were duly arrested. Finally, in September 1919, London declared the Dial "a dangerous body" and declared it outlawed. The British government sent over 40,000 troops in to "quell" the Irish, and the Dail went underground. A bitter guerrilla war ensued. What were the Irish, in Ireland and England to do? This is where Forest Gate's role emerges. 1. Home of a publisher for "The Rebels"
The Dail responded by publishing an Address to Representatives of Foreign Nations in January 1921 (see photo of cover, below). It was a well produced and tightly argued 40 page foolscap publication, signed by all independence-supporting Irish MPs and was clearly aimed at winning at least a diplomatic war, in an effort to gain independence for their country. Nothing unusual in this, except for the imprint, at the back of the publication - see above. 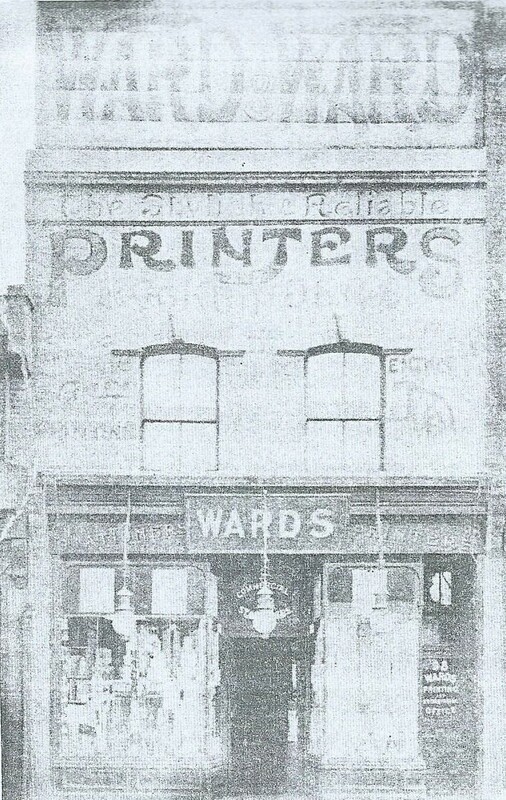 It was printed by the Woodgrange Press on Woodgrange Road. Quite bizarre. Quite how extraordinary can be gauged by the fact that the owner of this press was Charles Ward, a prominent local Tory (see here for details). He was, in fact, the leading light of the Municipal Alliance, a front for the Conservative party on West Ham council. Charles can be found in the pages of the Stratford Express during the three years effectively covered by this story banging on endlessly about how the Council was wasting money on providing services for poor people - but not once did he mention Ireland in his perorations. In March 1919 the Irish Self Determination League of Great Britain (ISDL) came into being. Its Constitution and Rules were published by the Woodgrange Press, 1920, who also published at the same time a report for the First Annual Delegate Conference Agenda. We can find no explanation for Ward's role in publishing the rebel material, other than a purely commercial one. He was later made a freeman of the borough of West Ham. The ISDL, mentioned by Berresford, above, reached a maximum membership in Great Britain of almost 30,000, in 1921. While its offices in London (Shaftesbury Avenue) were the focus of police raids and general harassment, the organisation functioned with frequent public meetings. In March 1921, its London District Committee launched a monthly journal, called the Irish Exile (not printed by the Woodgrange Press). It had a circulation of around 10,000 copies. Reading it today, it bears all the hallmarks of many rather tedious and worthy political publications currently produced. But, each surviving edition (and the publication pattern was pretty sporadic) gave details of what the ISDL's 40 branches' were up to. 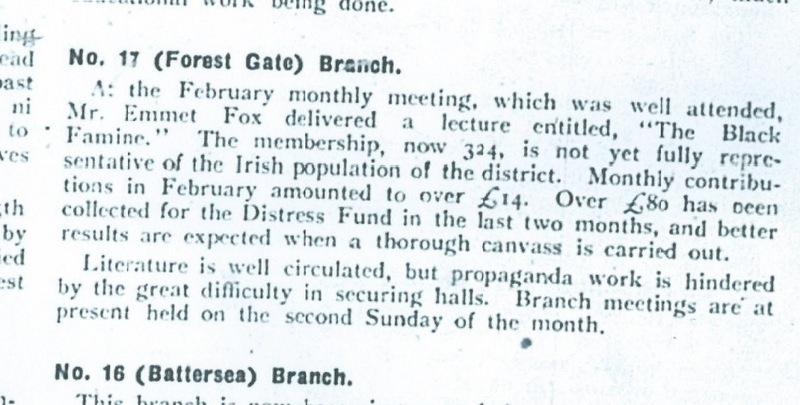 The Forest Gate branch's report, however, only appeared once: in the first edition (March 1921). It is reproduced below. It is a brief, but remarkable account. It was by far the most explicit of all the branch reports in terms of details of membership, activities and finances coming from any branch published in any on the nine editions of the paper. We can only surmise that the scale of activity described attracted police attention, and resulted in the branch, if not going under cover, in certainly being more publicly discrete about future events. The branch showed its presence in the Irish Exile in much more benign ways in future editions of the paper. The December 1921 edition, for example, featured a photograph of a victorious women's sporting team! (see below). The only other specific Forest Gate mentions came in the February 1922 edition, when details were given of three Forest Gate people selling tickets for an Irish event, and two mentions of Irish Language classes being held in Earlham Grove. These presumably took place in Earlham Hall, located opposite the home of Francis John Fitzgerald - see below. This ties in neatly with Forest Gate's most intriguing part in Irish nationalist activity, at this time. Early in December 1921, Francis John Fitzgerald, a 38-year old chemist of 128 Earlham Grove, was arrested at Euston while seeing his sister off on the Irish Mail. Along with five others, he was charged with stealing and/or receiving a cache of machine guns and hand grenades, stolen from Irish Guards barracks at Chelsea and Windsor, earlier that month. and location of the after gun theft "celebration"
The cache of arms was later discovered and amounted to 26 assorted guns (machine guns and rifles) and a quantity of bullets. On his first court appearance Fitzgerald was released on bail, on sums of £500 for each of the two charges he faced. It seems the theft was an inside job, with an Irish Guardsman also charged. 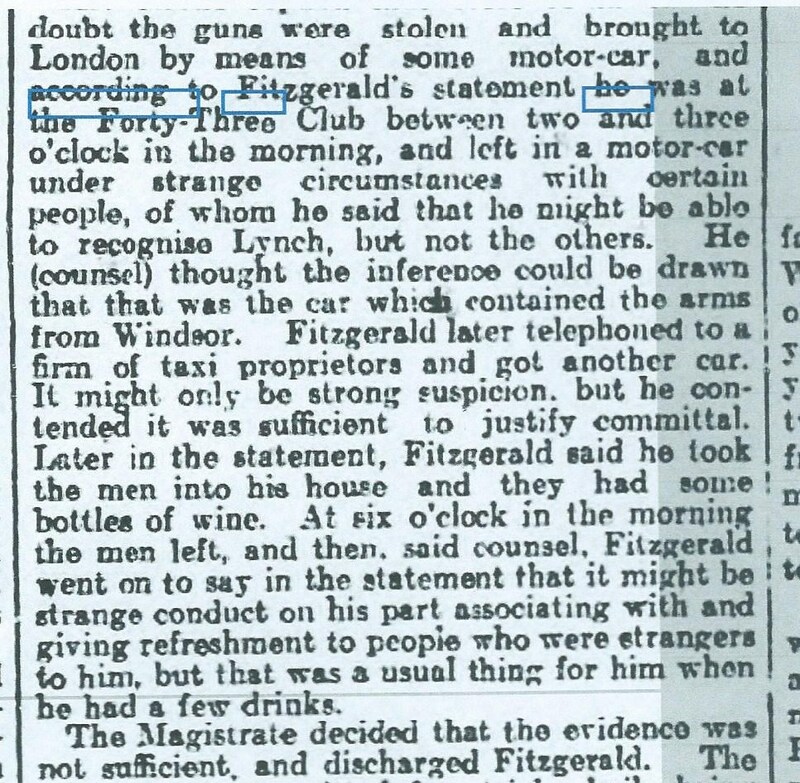 Fitzgerald was said to have provided the cars (hired from Leytonstone taxi firms) in which the others went to Chelsea and Windsor and stole the guns. After the raid at Windsor they all came back to Earlham Grove, via a West End drinking club, to celebrate. The police found large sums of money and ISDL literature at the lodgings of one of the other accused. This was the moment when the Anglo-Irish Treaty (December 1921) was signed, ending British rule in 26 counties of Ireland. It seems likely that guns were being assembled in anticipation of the outbreak of fighting between the republicans (who didn't accept the 26-county compromise adopted) and the new Irish government. Politics intervened, with the Home Secretary stepping in to obtain the release of two of the defendants (who proclaimed themselves political prisoners) and their return to Ireland. In early 1922 the British government released all Irish political prisoners, under agreements made within the Anglo-Irish Treaty. Fitzgerald was, however, discharged for lack of direct evidence linking him with the theft. His "story" was bizarre, by any standards, and is worth airing. 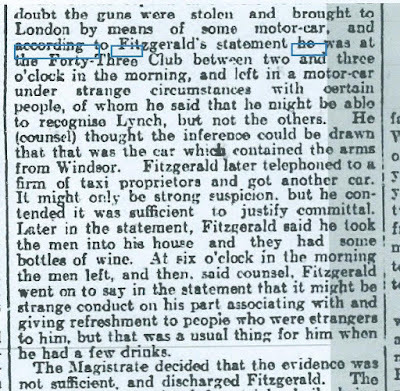 Fitzgerald's case was that he was drinking in the Forty-Three Club, in Star Street (just off Edgware Road) between two and three in the morning immediately after the raids on the barracks. At this point the men (who, unbeknown to him, apparently, were the gun thieves) came in. He ordered a taxi, from a firm in Leytonstone that he knew and took the men back to Earlham Grove "for some bottles of wine". The men left his house, suitably refreshed, at 6 a.m. later that day. 24 December 1921, with Fitzgerald's "defence"
Fitzgerald went on to say in the statement that it might seem strange conduct on his part associating with and giving refreshments to people who were strangers to him, but that it was a usual thing for him when he had a few drinks. The Magistrate decided that the evidence was not sufficient and discharged Fitzgerald. Interestingly, although Fitzgerald's story was widely reported in the British press at the time; almost all references giving his full address, the Stratford Express (Forest Gate's only local newspaper, at the time) chose not to cover it, at all. 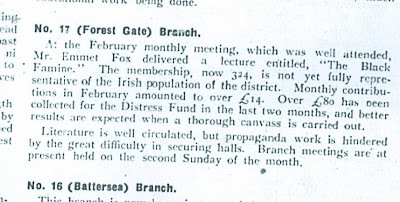 So, three quite extraordinary events occurred, closely linking Forest Gate with the ISDL and the struggles for Irish independence in 1921, with no apparent connection. Except, Francis John Fitzgerald was the brother of Sinn Fein's propaganda chief, at the time (see below and the next blog on this site for very full details). So, how about this for a link between the three events? Fitzgerald, a keen republican, was a major force in the extremely active Forest Gate ISDL branch, and popped round to his local printer - on Woodgrange Road - to get ISDL and other similar literature printed. His activism was such that he was in some ways behind the gun raids on the barracks and by pre-arrangement to met the raiders at a club in the West End, to get a report back on the success or otherwise of the raid. Satisfied that all had gone well, he brought the raiders back to Forest Gate to celebrate? Not a ridiculous theory, but there is no firm evidence to link the three Forest Gate episodes. Although the case against Fitzgerald was discharged in December 1921, when that against the others accused came to the Old Bailey in January 1922, his "innocence" was more than called into question by them. Roche, the Irish Guards sergeant and the inside man on the arms raid, pleaded guilty and became a prosecution witness in the case. His evidence apparently was not made available to the police court that had discharged Fitzgerald in December 1921 (Portsmouth Evening News, 21/02/1922). He stated that Fitzgerald had provided 'an open touring car', which picked up Roche and the other three at Marble Arch, drove them to Windsor Barracks where they stole the guns, then back to the 43 Club, then on to Fitzgerald's employer's factory in Stratford, and then to Earlham Grove (Scotsman, 18/01/1922). The prosecution stated that the presumption was that the car which took them all back to Stratford was carrying the guns from the Windsor raid. Fitzgerald, who had always described as "a chemist", was presumably an industrial one, working (as employee - as suggested here - or owner - see later) in one of Stratford's many chemical works. This claimed visit to the factory makes more intriguing the evidence provided by the police that the notebook owned by Hogan - another of the accused (who proclaimed himself an IRA commandant), included notes on chemicals which could be used to make explosives (Scotsman, 18/01/1922). Roche's evidence also stated that Fitzgerald's brother was 'the propaganda agent of Sinn Fein' - see next blog for full details (Nottingham Evening Post, 28/01/1922), which makes more interesting an exchange which took place in the House of Commons on 14 February 1922. Lieut-Colonel Croft: Had Captain Fitzgerald any thing to do, or was he suspected of having anything to do, with the stealing of machine-guns and ammunition from the barracks of the Guards? Mr Churchill: How can I answer a question like that? It is not clear whether this "Captain Fitzgerald" was, in fact, the brother of Francis Fitzgerald of Earlham Grove, but it seems very likely. 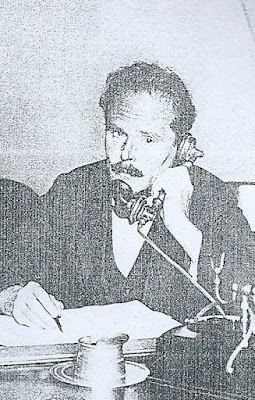 On the one hand, Fitzgerald is a fairly common Irish name, and so it could just be a co-incidence, but on the other - we know that Francis Fitzgerald's brother was "a propaganda agent of Sinn Fein" and the question and answer quoted above point in the direction of an apparent connection at least being raised. So, were questions raised in the House about Fitzgerald's brother? We assume we will never know for sure. What we do know, however, was that his confirmed brother was a very interesting character - see the next blog. An article in the Scotsman of 28 August 1922, entitled 'Arms for Ireland: Scotland Yard and Stratford Raid'described a raid by Special Branch detectives on a warehouse in Union Street Stratford. Their haul was boxes full of Hotchkiss machine guns. The surprise police raid in Union Street, Stratford, London, when a number of boxes containing machine guns were seized, was the result, a representative of the Press Association has been informed of certain information which came into the possession of the Special Branch of Scotland Yard a few days ago. The information disclosed the fact that something of importance would be found at a certain address. Careful watch was kept on the place for a time in the hope that the person who had deposited the stores would visit it, but, as he did not do so, the police decided to enter. For some time past a close watch has been kept by the police on all ships leaving the London docks as it was known there was an intention to ship arms to Ireland. No arrest has yet been made in connection with the discovery of the machine guns, but the police are following up their enquiries. There was much discussion in Irish circles in London on Saturday as to the raid which took place at the warehouse in Stratford. Five Hotchkiss guns were found and taken away. Mr Francis W Fitzgerald who owns the warehouse concerned and lives in Earlham Grove is a brother of Mr Desmond Fitzgerald, Minister of Publicity to the Irish provisional Government. Speaking to the Press Association representative on Saturday, Mr Fitzgerald denied that there was anything sinister about the finding of guns on the premises. He admitted he was keenly interested in Irish affairs, but was not active in any way. The suggestion that the guns were intended for use in this country, he asserted firmly, was a ridiculous one. "I was simply storing the guns", he continued. "I did not buy them, these Hotchkiss guns were perfectly new and in their original cases. They belong to a city merchant who bought them under licence in an open way. The guns cost roughly £1,000. I told him that in my opinion, the guns would be bought by the Irish Free State army, and he secured them on my recommendation. Lately all members of the armaments ring have been buying in their own makes of guns and revolvers surplus to military requirements with the object of getting everything in their hands. Armament firms are opening offices in Ireland with a view to doing business with the Free State Army. The man who bought the five Hotchkiss guns was going to negotiate with a view to a deal with the Free State Government. "The guns were loaded to a van in Charing Cross Road on Thursday evening. On Friday I saw detectives watching. I telephoned Scotland Yard and the guns were taken away. The whole thing was just a commercial deal and quite a legitimate proceeding." So, another bizarre story from Fitzgerald, attempting to explain away a guns cache he was storing, that does not stack up with his previous activity. As far as we can see the story ended there, and Fitzgerald wasn't prosecuted. Quite what happened to Fitzgerald, we do not know. He may deserve a footnote as a brave Irish patriot, if a full story of the ISDL is ever published. 1. Huge thanks to Mark Gorman for pointing us in the direction of information in this post, and digging around so assiduously. 2. Much of the information on the ISDL, who provide a central and linking theme to these Forest Gate activities, comes from a brief history of the group, written by Peter Berresford Ellis and can be found here. Interestingly, he ends his article with a plea for a fuller history to be written: "The story of the ISDL is an essential history waiting to be produced." Perhaps we will have to await its publication to see whether the three bits of the Forest Gate story are linked in the way we posit, above, and Fitzgerald can claim his role as an English-based Irish freedom fighter. "...the creation and recognition of the Republic, in the 1920s..."
Ireland became a republic only in 1948. The 1922 treaty made it a self-governing dominion, like Canada.